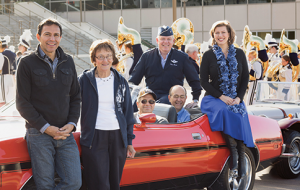 Honored with Alumni Achievement Awards during Homecoming 2013, these 11 alums represent the finest from each college and the Kennedy Center. Why chemistry: Low’s father, Philip F. Low (BS ’43), a distinguished chemistry professor at Purdue, recommended chemistry as broad preparation for a variety of careers—from medicine to business to science. The younger Low stuck with chemistry and eventually landed a job at the same university as his father. Hobby: While in Texas learning to navigate the B-1 bomber, Harris had a lot of time alone in his visiting officer’s quarters. So he purchased an oil-painting starter set and how-to book. “I pulled a picture of one of my daughters out of my wallet and said, ‘Well, how hard can it be?’” Now portraits he has painted of his four daughters adorn the walls of his home. 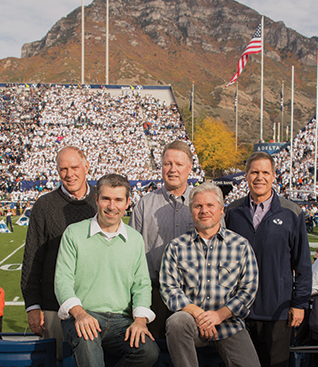 Alumni Achievement Award recipients (from left) Philip Low, Richard Culatta, Richard Herlin, Brigham Taylor, and Matthew Tueller celebrate their return to campus by cheering on the Cougars at the BYU football Homecoming game. Winners of Alumni Achievement Awards, (from left) Art Rascon, Sandra Mangum, Craig Meyers (seated), David Harris, Nathan Sheets (seated), and Hannah Smith enjoy celebrity status in the 2013 Homecoming parade.